Inspired by Waldemar Januszczak’s recent BBC programme Mary Magdalen: Art’s Scarlet Woman, I wanted to share my favourite vision of Mary Magdalen. Painted by Hughes Merle in 1868, I think this is the most emotionally charged and beautiful images of the saint. The first thing I notice is how close we are to her face. It is unusual, although the image has been cropped to focus in on the drama. Perhaps the developments in photography are responsible, as it was contemporaneously influential on a young group of artists who would be come known as the Impressionists. In a truly Baroque manner, Mary’s face expresses extreme religious rapture. She is almost in a trance-like state with her tearful eyes cast towards heaven, almost rolling into the back of her head. Biblical figures who had spiritual experiences were transformed into cult figures during the Counter-Reformation, when communicating redemption, repentance and penance was particularly important to the Catholic Church’s message. Think of Bernini‘s Ecstasy of Saint Teresa or Caravaggio‘s Saint Francis of Assisi in Ecstasy. As Waldemar astutely points out, Mary is only mentioned three times in the Bible – when Jesus cleanses her of her sins, at the crucifixion and at the resurrection. 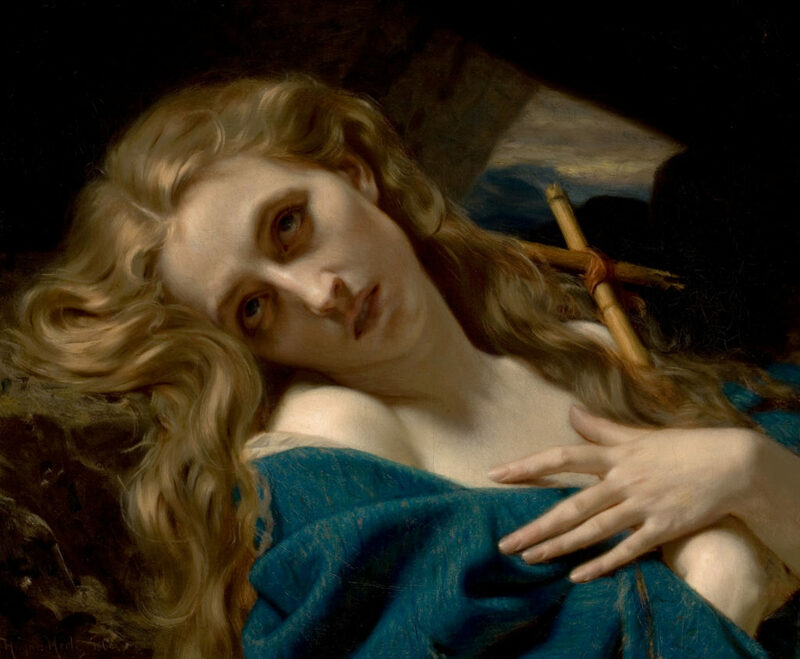 But she was transformed into an icon for sinners, one that would give hope of forgiveness, and scenes of the Penitent Magdalen were to become key to the Church’s mission of proselytism or regain those who had ‘lapsed’. The second most dominant thing I am drawn to is the colour scheme. The canvas is unequally divided diagonally, the light tones of Mary’s creamy skin and her golden blonde hair contrasting strongly with the almost black recesses of the cave. Mary Magdalen is bathed in divine light. Then there is that shock of cerulean, a swathe of cloth that falls from her right shoulder, her lovely long tapered fingers losing grip on the fabric. Perhaps it is symbolic of her casting off the worldly goods she so valued as a courtesan. It brings a much needed flash of colour, but also its rough linen-like texture emphasises the Magdalen’s soft skin and glossy locks, which in turn contrast with the rocky environment. Her signature long hair reminds us of when she washed Christ’s feet with her tears and dried them with her hair. According to legend, Mary Magdalen lived out the last years of her life in solitude in a mountain grotto in the south of France. Apparently she did not eat, but was sustained by music borne down from heaven by angels. Mary’s bamboo crucifix points out towards a uninhabitable landscape through the opening of the cave, a cold and desolate looking place, but one where Christ is still present.